The first time I saw clarification techniques being used was years ago, as a budding young chef in Toronto at Splendido Restaurant. I was watching a stock be clarified into a consommé using egg whites and vegetables. I remember how intense the spotless kitchen was. Always sweating from anxiety, I was under constant pressure, learning and growing in my craft. It wouldn’t be until years later, that I saw a similar technique being used in mixology: Clarified Milk Punch. A style and technique to make Punch that’s over 150 years old. 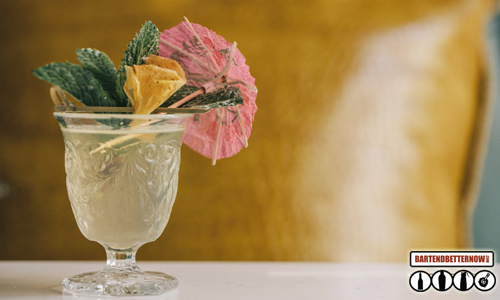 It was another bartender in Toronto, but hailing from Ireland originally, Michael Mooney who was making his version of milk punch at a then well-known bar, Geraldine. Clarification, by definition, is removing solid matter from (a liquid); to make into a clear or pellucid liquid. The texture and mouthfeel of clarified Milk Punch is luscious, rich, silky, and elegant. In a practical sense, when it comes to service in your bar, milk punches are consistent, and check times are minimal. It takes only a brief moment to pour from fridge to chilled glass and garnish (no shaking or stirring necessary). Also with a long shelf life of 3-4weeks, your bartender is working smarter, not harder. And that is always a huge plus for both you and the guest. 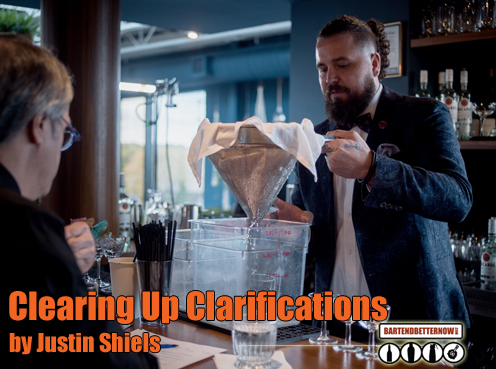 Clarification doesn’t have to be complicated, and there are several different types of clarification, be it the use of filtration, gravitational, or gel. They each have their own application. Clarification filters are much finer than the ones you would use for coffee, and take a frustratingly long time. Unfortunately these aren’t super practical unless you’re using them on an industrial level. Gel clarification works incredibly well and is relatively inexpensive and simple. Essentially, the particles that were making your liquid (be it citrus or strawberry juice, for ex.) cloudy remain trapped in the gel and what filters out is clear. There are several different types of gel clarification including egg whites, which traditionally is used for turning stocks into consommes. Alternatively, you can use the Freeze-thaw Gelatin or Agar approach, with which a small percentage of either is added to your liquid, you then freeze overnight, and slowly defrost in a refrigerator over a fine filter. The Gelatin or agar gels are very porous and hold onto the cloudy particles incredibly well, leaving behind a thick goey mess and a crystal clear liquid. Gravitational clarification typically involves somewhat expensive equipment called a centrifuge or wine fining agents. Most of the time, suspended particles are denser than the liquid they’re floating in. Essentially a centrifuge uses gravitational pull to separate these particles. The use of wine fining agents and racking is also beneficial in this process. My Clarified Milk Punch: the Fino Colada was created for Bacardi Legacy 2018 and was inspired by a trip I took a few years ago to Havana, Cuba. I was at the bar in the famous Hotel Nacional and ordered a Pina Colada from the bartender. It was the by far the best Pina Colada I had ever had. Watching him make my 2nd (because obviously I ordered another round) I noticed him add another ingredient I had never seen before in a Pina Colada; ICE CREAM. Obviously, the vanilla ice cream added another layer of richness and silky mouthfeel, but I had never thought of this simple addition. Wanting to recreate the Pina Colada, in a more refined and elegant form, I decided to approach it as a Clarified Milk Punch. This time, instead of using Ice cream, my dairy component: homogenized milk would add the richness. At the same time, clarifying would produce something much cleaner, for today’s modern palate. When I started my Bacardi Legacy journey, I was inspired by the resilience of Don Facundo, who even after being exiled from Cuba, managed to build Bacardi into one of the world’s most recognizable and widely enjoyed Rum brands. 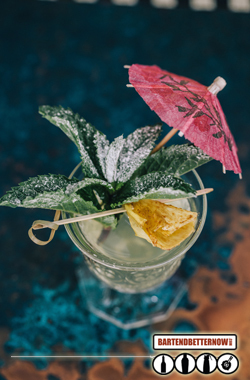 I knew that if I wanted to move forward in the Bacardi Legacy competition and compete not only on the National, but on the Global level, I would have to create a drink that could be easily enjoyed anywhere in the world, and yet showcase a technique that is both classic, and innovative at the same time. Below is my recipe for the Fino Colada I hope you’ll take the time to try clarifying something of your own. Bring Milk to a simmer and add slowly to cold Punch with an additional 60mL of Lime juice. Let Curdle and rest for 30 seconds to allow milk proteins to bind with other fats and “impurities” in the punch.